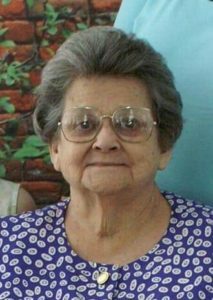 Smithfield – Ruth Arlene Game Raynor, age 87, died Thursday, November 15, 2018 in UNC Johnston Health in Smithfield. Born May 8, 1931 in Johnston County she was a daughter of the late Clarence and Fannie Johnson Game. She was preceded in death by her husband, Willie Clarence Raynor; brothers, Thurman Game, Lee Game, Leo Game, Raymond Game, Kenneth Game, and Thomas Game; and sister, Edna Futch. Funeral services will be conducted at 2:00 p.m. Monday, November 19, 2018 in the chapel of Parrish Funeral Home with Rev. Jerry Barbee and Rev. Mack Perry officiating. Burial will follow in Princeton Cemetery. The family will receive friends from 6:00 – 8:00 p.m. Sunday night at the funeral home. Surviving are her sons, Clarence “C.L.” Raynor and wife Glenda of Keeseville, NY, and Bobby Raynor and wife Teresa of Pine Level; daughter, Lisa Davis of Pine Level; grandchildren, Rhonda Clarise Raynor, Robert Clarence Raynor, Amanda Raynor Foxworth and husband Clay, Amber Leigh Raynor, and Emma Ruth Davis; and great grandchildren, Haley Elisabeth Raynor, Benjamin Clayborn Foxworth, and Ronald Carson Foxworth. The family would like to express their sincere thanks to the staff at Smithfield Manor Nursing and Rehabilitation and to the nurses and staff of UNC Johnston Health, 2nd Floor PCU, for all the loving care they have provided to Ms. Raynor throughout her stay.